Form No. 1-100 - 17.11.11. Sent date 15 APRIL 1912. No. OLYMPIC, Office of Origin OLYMPIC. 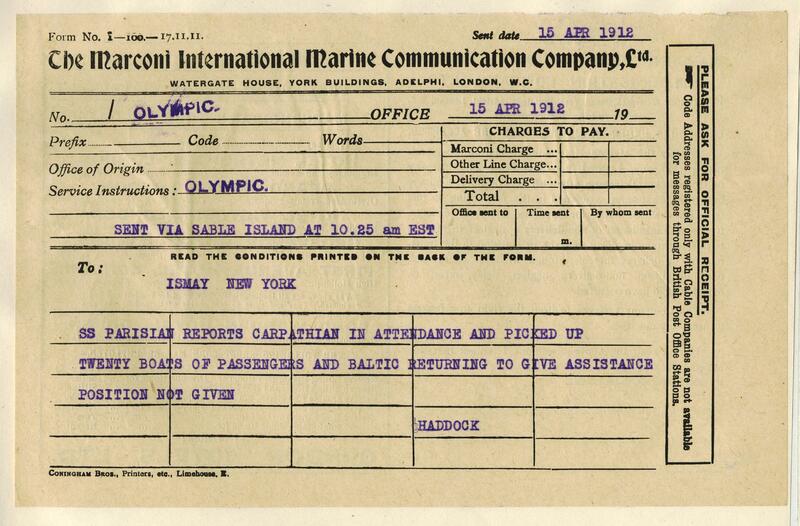 Service Instructions : SENT VIA SABLE ISLAND AT 10.25 am EST. To : ISMAY NEW YORK. SS PARISIAN REPORTS CARPATHIAN IN ATTENDANCE AND PICKED UP TWENTY BOATS OF PASSENGERS AND BALTIC RETURNING TO GIVE ASSISTANCE POSITION NOT GIVEN. HADDOCK.